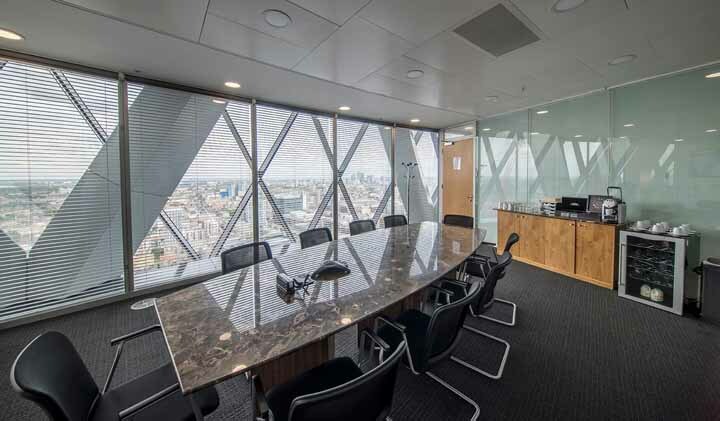 Rent serviced offices in St Mary Axe in the City of London with business centres available inside the iconic Gherkin skyscraper at No. 30 or directly opposite in No. 63. Photo credits: Slug & Lettuce St Mary Axe by Babz Otenaike; itsu by itsu; Pret A Manger by Riccardo Galli; EAT. by A K; The Sterling in the Gherkin by The Sterling; Balls Brothers Bury Court by Balls Brothers Bury Court; Searcys at The Gherkin by Oaa Patiluntakalkool. The unusual name St Mary Axe used to be the name of a medieval parish in the City and there was a St Mary Axe Church here until it was demolished in the 16th century. 30 St Mary Axe was built on the site of the old Baltic Exchange which was destroyed by a bomb. Norman Foster and Arup Group designed the tower which was also known as the Swiss Re Tower.